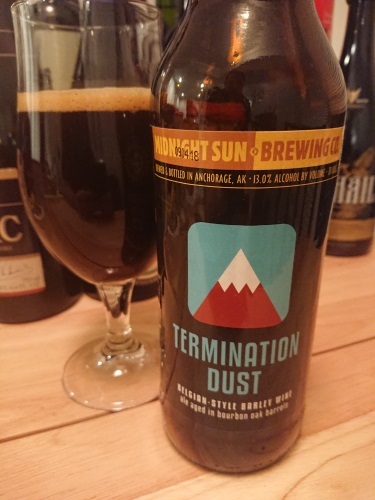 Termination Dust by Midnight Sun Brewing Co.
Belgian-style barleywine aged in bourbon oak barrels. The Alaskana term “Termination Dust” means a light, high altitude snowfall that indicates the end of summer. By mid- to late September, Anchorage folks look to the east at the Chugach Mountain range for Termination Dust. Head Brewer (and Alyeska Ski Patrolman) Lee Ellis determines when this beer will be released based on when Termination Dust hits Flattop, a popular hiking peak that is visible from MSBC. We tap this beer each fall when Lee gives the official call.